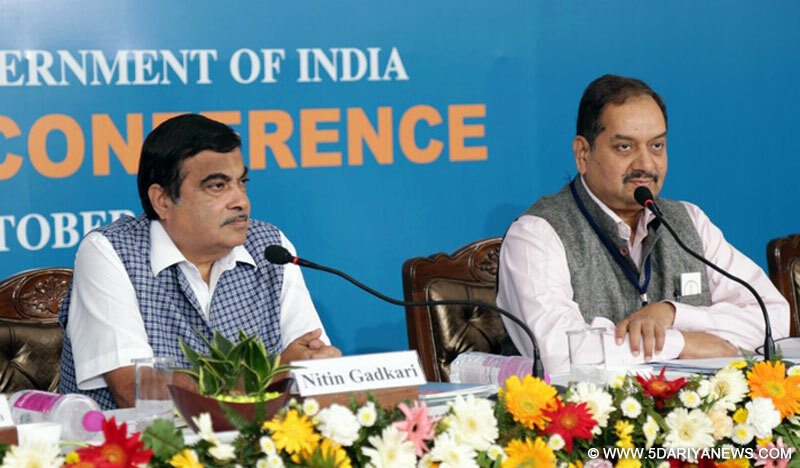 While addressing the Regional Editors Conference in Chandigarh today, the Minister for Road Transport Highways & Shipping, Shri Nitin Gadkari gave an overview of his Ministry’s achievements as well as plans for future growth. Beginning with Shipping, he informed that while ports around the world had faced losses, Indian ports had shown a growth of 2.6 percent, earning profits of nearly Rs. 6000 crore. At present the country has 12 Major ports and there are plans to add 6 more. The Minister briefly touched upon the Sagarmala Project whose port-led economic growth intends to give a boost to the coastal economy, as it would develop manufacturing hubs as well as promote fishing. The Minister said that according to experts the Sagarmala Industrial clusters will attract investment of 8 lakh crore. Shri Gadkari informed that it is necessary to increase the draft capacity of Indian ports to enable larger ships to dock so as to increase the transportation capacity and reduce commercial cost. Shri Gadkari said that at present there are only 5 inland waterways and his government has identified 106 more, and now these 111 waterways are being developed as National Waterways. He added that the waterways will prove to be a game changer as this would reduce the cost of transportation for goods and passengers, reduce road congestion as well as play a vital role in reducing pollution. This will also give a boost to tourism. He said that his government plans to construct 2000 water ports. He also said that to enhance the use of these inland waterways sea planes, hovercrafts and amphibious buses would be introduced. While speaking about national highways, the Minister informed that the government plans to connect Mansarovar by next year. He said that Katra would also be connected by an express way that will reduce the travel time by 6 to 7 hours. Shri Gadkari informed the senior journalist that his government has restarted almost 95 percent projects that have been stuck for various reasons. The Minister said that his government would make sincere effort to add one lakh kms. roads during the five year term. The Minister also pointed out that there was an urgent need to reduce pollution in the country. As a step in that direction he planned to scarp 15 year old trucks. As a part of this scheme it was proposed to recycle the various parts of the truck and also provide concession to mitigate the loss to owners. Shri Gadkari also expressed concern about traffic accidents and lamented the large numbers of deaths and injuries caused to persons on the country’s roads. In this regard, he said that his Ministry had indentified 726 black spots in the country. For prevention of accidents he said that road engineering played a vital role. The Minister said that it was necessary that at the stage of preparing the detail project report (DPR) that various aspects of engineering should be taken into consideration. Adding crash barriers, signs, lights and markers at appropriate places would go a long way in making our roads safer.